Acupressure point locations are spread throughout the body along acupressure meridians and ensure that our vital energy flows freely and healthily. In chinese medicine they call it chi, and chi runs along the meridians of our bodies. 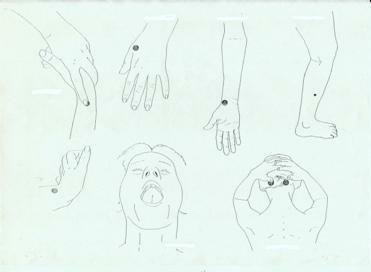 Acupressure meridians are energy flows which run right through our bodies. They run in north-south directions and they are based on the theory of yin- yang. That is male - female, and the balance of all energy within the universe. They are also reflected in the feet and ears in reflexology. If they become blocked either from emotional or physical distress then disease can occur. To maintain our optimum health it is vitally important that we keep these accupressure meridians flowing freely and in balance. The organs and the systems of our bodies are seen as having predominately a yin or yang character and each acupressure meridian is connected to an organ or to a set of organs. Yin energy is that which is moist, cool, feminine and passive. So those organs are your lung, your spleen, your kidney, your heart and circulation, and lastly your liver. This set of acupressure point locations runs upwards from your feet to your heart. You will find them mainly on the front of your body. Each meridian is actually a part of a pair, one either side of your body. Yang organs on the other hand, are male energy, hot and active. So that's your small intestine, large intestine, stomach bladder, triple warmer (which is the body's heat control system) and of course your gall bladder. In addition to the twelve pairs are two single meridians exactly in the centre of your body. These are considered to regulate all of the others. The Governing Vessel which is yang and Conception Vessel which is yin. By balancing the meridians it is possible to remove detrimental energy blocks from the vital organs in the body and begin to foster healing. The acupressure point locations act as traffic lights if you like. When they become blocked because of dis-ease, it is easy to tell just by touch... When you press them, it hurts. By pressing each of the acupressure point locations until they stop hurting and then becomes warm, you can easily clear the bockage and encouraging the healthy energy flow. By following the meridian up or down the direction of its flow and emptying the blocked accupressure point locations, you align the energy flow and allow healing to take place. You may find that each of the acupressure points locations fill up again almost immediately afterwards. I would suggest that you empty them no more than twice a day though as there is always a danger that you could overstimulate the organ. To maintain our optimum health it is vitally important that we keep each of the acupressure point locations flowing freely and in balance. This set of meridians runs upwards from your feet to your heart. You will find them mainly on the front of your body. Each meridian is actually a part of a pair, one either side of your body. These are places on the meridians which act as traffic lights if you like. When they become blocked because of dis-ease, it is easy to tell just by touch... When you press it, it hurts. By pressing it until it stops hurting and then becomes warm, you can easily clear the bockage and encouraging the healthy energy flow. By following the meridian up or down the direction of its flow and emptying the blocked accupressure points, you align the energy flow and allow healing to take place. You may find that the emptied accupressure point locations fill up again almost immediately afterwards. I would suggest that you empty them no more than twice a day though as there is always a danger that you could overstimulate the organ. 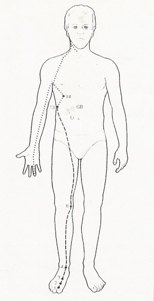 Full diagrams of all the acupressure meridians and their flow through the body. If they become blocked either from emotional or physical distress then disease can occur. To maintain our optimum health it is vitally important that we keep these meridians flowing freely and in balance. This set of acupressure point locations run upwards from your feet to your heart. You will find them mainly on the front of your body. Each meridian is actually a part of a pair, one either side of your body. This is done by working with specific acupressure point locations. You may find that the accupressure points fill up again almost immediately afterwards. I would suggest that you empty them no more than twice a day though as there is always a danger that you could overstimulate the organ. Understand the importance of liver damage symptoms and how to help to clear it using these acupressure point locations. Using accupressure is a valuale tool for many conditions, but especially migraine. The Apothecary Migraine Facial Massage Treatment utilises the benefits of the essential oils alongside the effects of stimulating the liver acupressure point locations (see diagram above). You can further improve it with these other acupressure point locations specifically for migraine. As with all our treatments available in our store, feel free to contact us for futher advice.